Purple lovers, grab your bibs and set your mouths to drool. 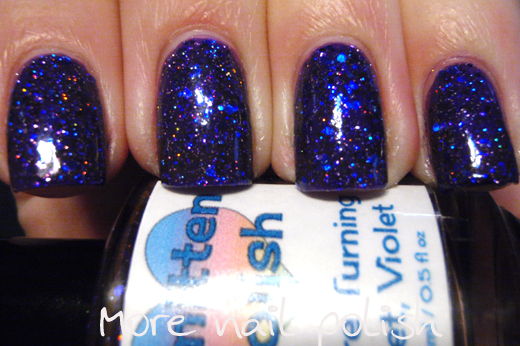 Today's beauty is You're Turning Violet, Violet from the recent Confection Collection by Smitten Polish. The lovely Noelie from Noelie's Nails has created this line and if you don't follow her blog your should, because she has the most stunning nails that are always perfectly painted. Now, let's get onto this polish. 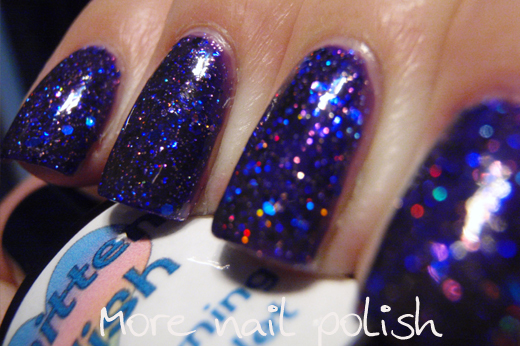 Firstly, holo glitters, why are you such a PITA to photograph? I like taking photos of glitters in the shade, or preferably on an overcast day, because that way the glitters don't reflect to much light and you see the polish better. 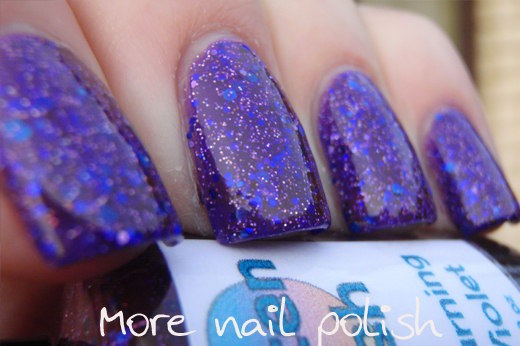 But with holo glitters it means they look so one dimensional and you don't see any of their multi-shifting colours. Damn you! You're Turning Violet, Violet has different sizes and shades of purple and blue holographic glitters, all in a fantastic purple jelly base. I applied three coats on it's own, cause I wanted it to look exactly like the amazingness that is in the bottle. The formula was very easy to work with and I didn't require any clean up for these photos. I also applied this over a PVC glue peel off base coat, so I know removed will be easy peasy too! This did dry rough and I put on two coats of Ulta 3 Non chip and a coat of Seche Vite to make sure it was glassy smooth. Even with 7 coats in total, this never felt too thick and I had no shrinkage, I just felt like my nails were bullet proof. In an effort to capture the sparkly goodness, I took these photos under the bathroom light. 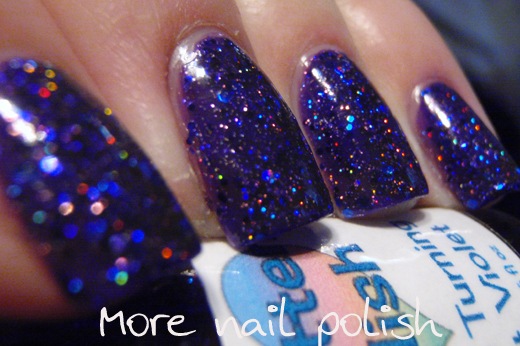 The purple jelly base appears darker, but you can start to appreciate the multicoloured sparkles in the polish. The polish feels like a purple version of China Glaze Atlantis, except with different size glitters. A complete stunner! 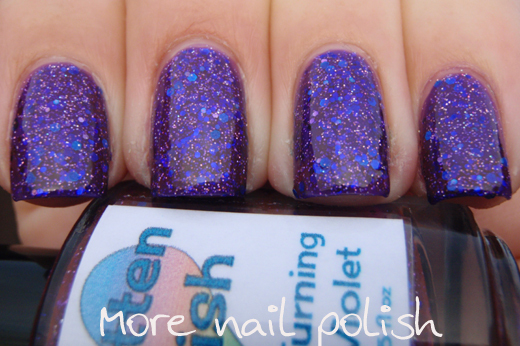 Smitten Polishes are available from her Etsy Store, and updates on Noelie's Nails blog. Wow, those last shots are amazing! So shiny and so many sparkles! Wow. Just.. Wow! This is absolutely gorgeous. 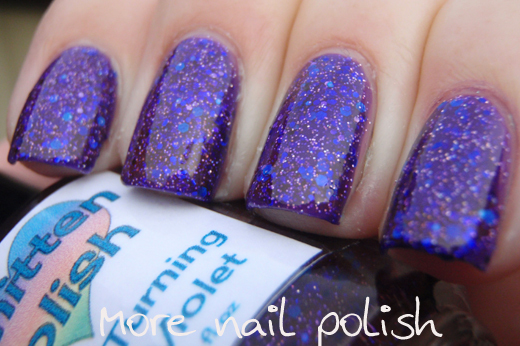 That holo is beyond dazzling--this is so, so lush! There's only one word that covers what I think about your swatches: Wow!!! This polish is really making any passionate drool! !